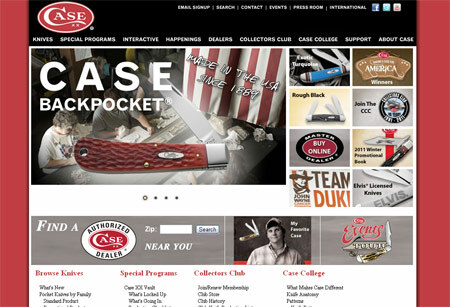 Frequenters of the Case cutlery website will notice that Case has rolled out a new look for their online presence. The navigation is a lot cleaner and now you can view the families of the different blade styles from one page, which makes cruising for new knives a lot easier. I still don’t really dig the whole “vault” thing I ran across on their special programs page. However, I do understand they have production deadlines to meet and can’t do small runs of tens and fives when the next huge shipment of the latest and greatest is supposed to be heading out the door. Also, pink is an interesting, though brand correct, choice for the outer background area. In any event, the quality of the blades and striking handle designs are, as always, in full effect. I just wish you could buy them straight from the site instead of dealers. I’d hardly call the slightly faded red color “pink”. Very hard to find a particular knife, for instance what if you want to see all the single blade non-locking folders, because you can’t remember what a sodbuster is called. The yellow handled one is in a different family from the black handled ones. It sure would be nice to have a check off menu to pick which features you want to see or not see and have the items displayed. Also, there is no story or additional information available when you select a knife, just a larger picture, that would be nice. Certainly a plain website, it’s a good thing the product will carry the website. The background color is very close to Persian Red or Crimson. Tritanopy is a type of color blindness that can cause that color to appear more pink to some people, but my guess is your monitor isn’t calibrated.